Yesterday was Frank's birthday, and what he wanted to do on his special day was go to see the Walking with Dinosaurs: The Live Experience stage show. Since you only turn 48 once, I decided to indulge him and go along. Alex, of course, was thrilled. Alex and Frank are big fans of the Chased by Dinosaurs BBC series. If you're not familar with it, a guy named Nigel Marven takes a trip back in time to visit with dinosaurs. It's a very well done series, and the dinosaurs really come to life with a combination of CGI, puppetry, and animatronics. Nigel get into a few scrapes now and then, just to make it interesting. He's like the Steve Irwin of the Jurassic era. They've taken this concept and turned it into a live-action stage show, with an "archaeologist" guide and some life-sized dinosaurs that move, make noises, and act a lot like what I imagine dinosaurs would be like. The host explains the different periods, from the Triassic to the Cretaceous, and the famous Jurassic in between. The big finale is the T-Rex, which stops and bellows at the audience. The interesting thing about the show is the way the dinosaurs move. The small raptors are manned by a person and you can see their legs sticking out from the costumes, but its not at all like a big stuffed Barney. It's actually pretty convincing. The person inside is controlling a number of different features, from the tail to the head movements. The big dinosaurs, like the impressive brachiosaurus, come out on a t-bar on the ground with a person inside a little capsule under the dinosaur who drives the whole thing. The legs move up and and down, and the head and tail are controlled as well. The big ones were pretty impressive, and not bad actors as well. Most of the kids in the audience found it a bit too loud, especially when the T-Rex roared at the audience. Alex spent most of the second act with his fingers in his ears. Though there were quite a few really small kids in attendance, I didn't hear anyone crying. I wouldn't take a child (of any age) who is particularly noise-sensitive. It was a little scary, but no blood was shed, and no dinosaurs were harmed in the making of this stage production. When we got to the arena, Alex said, "Isn't this where the Sharks play?" I told him that it was the same arena, and he said, "So the dinosaurs will be ice skating?" I'm sure if the producers had thought of that, they would have been. I have to say, I thought this was one of the more asinine ideas for a stage show that I'd ever heard of, but then again, if Bob the Builder can have a show, why not the less cuddly ankylasaurus? Personally, I'm waiting for Journeyman: The Musical. Actually, I'd be happy if Journeyman just survives the entire TV season, since I'm one of about six people who watch that show. My love for Journeyman is an entire blog post in itself. The show is on at HP Pavilion in San Jose through December 30, then moves on to Sacramento and Portland and other places around the country. Click here to order tickets. The biggest news is that, in spite of Glennia continuing full time in her job, she is now a committed blogger. She writes here (www.thesilenti/com) and as a contributor to several group blogs as well: Silicon Valley Moms Blog, Kimchi Mamas, and Moms Speak Up. In October, she and two friends launched MOMocrats, a political blog supporting John Edwards' bid for the presidency and progressive politicis in general. The blog has become popular very quickly, and was quoted in the New York Times political blog, among other media outlets. A highlight of her blogging career came in July when she attended the BlogHer Conference in Chicago. She had her first print article appear in Koream Journal, based on one of her blog posts about her mom becoming a US citizen. Check out all the other blogs when you have a chance. For those of you wondering what happened to us last year, we apologize for not sending out a Christmas card or letter. We lost Frank's Dad, Jim, right before the holidays last year, and it really took wind out of our sails. There were many details to tend to, and writing our normal holiday letter fell down to the bottom of the list. We feel Jim's loss every day, and miss his gentle smile and wise counsel. It was a heavy blow to the family and all who knew and loved this very special man. As the new year has unfolded, we have resumed our usual slate of family travels. Our biggest trip of the year was to Greenland. It was a special place to mark Frank's 100th "country", and marked Alexander's first trip north of the Arctic Circle. 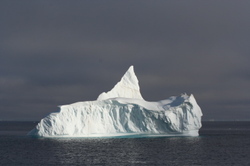 We drifted among fantastic glaciers and icebergs, bathed in the glow of the midnight sun, and saw whales, both in the sea and on the menu. Alexander lost his 2 front teeth and discovered that the Tooth Fairy still delivers in the far North, and that she pays in local currency. We also took a ship along the towns villages of western Greenland, and took a long range helicopter flight over the ice cap (covered with many dark blue melting pools). 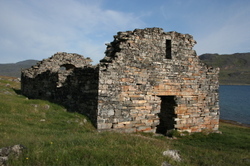 In Southern Greenland, we had the chance to explore Viking ruins over 1000 years old, and several other beautiful mountainous fjords as well. Even though parts of Greenland are cold, we were greeted warmly by the Greenlandic people, and had a wonderful time. Our travels began in February, with a trip to our Hawaiian timeshare on Kauai, with Grandma Chris in along too to get a break from the Indiana winter. We feasted at a traditional luau, and took a spectacular helicopter trip of the island, which didn't go over so well with Alex. We enjoyed the time together, and seeing our old friends the Forbes. 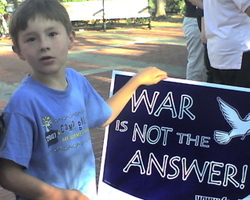 Other family trips have been to Washington DC, to protest the Iraq war with Frank's cousin Franz in March; to Michigan on the sad occasion of the funeral of Frank's Uncle Bob, to Ohio and Indiana for Alexander's 7th Birthday with Grandpa June, both Grandmas Jeanie and Chris, and Great Grandma Lois; Austin, Texas for a visit with Glennia's brothers; along the California coast for a wedding of Frank's friend Matthew, and to the red rock country of Capitol Reef in Utah for a wedding of Glennia's friend Gail. Frank has also earned his share of frequent flyer miles with business travel on various trips for meetings and conferences around the US, and to Puerto Rico, Korea, Japan and China. He is well recognized and a sought-after speaker in his field. Unfortunately, with school and work, it's not possible for Alexander and Glennia to come along on these trips now. We will, however, all be able to go together to watch whales in Baja California for a week after New Years. Alex had a summer of various fun camps and 2 weeks at "Camp Grandma" with his Campbell grandparents in Ohio along with his cousin, Nico. 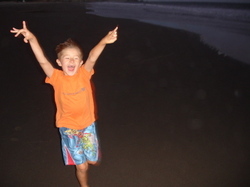 He returned to a big birthday party at home with friends from the neighborhood and his classmates from school. Then, he entered 2nd grade, and the weekly homework has been a bit of a shock. He balances the books with soccer, Kung Fu and Cub Scouts. He also keeps busy taking chess lessons and Spanish after school. So, that's about it from us. We hope this new format works for you and saves a few trees; please keep in touch by e-mailing us, or just by adding comments to one of Glennia's blog postings. Happy Holidays to all of you, old friends and new. We wish you good health, happiness, and peace, wherever your travels may take you. I don't know if it was NaBloPoMo that did me in, or having Frank out of town for a week (again), or the general Christmas madness, but I haven't been doing much blogging lately. Not here, or here, or here, or even over here. Hopefully, with Frank back, I'll find something to whine about, expound on, or reminisce about soon. For now, I do have a new review on The Silent I Speaks for the Parent Bloggers Network, for a toy that Alex just loved. Go check it out, especially if you have a 7 year old that you don't know what to get for Christmas. 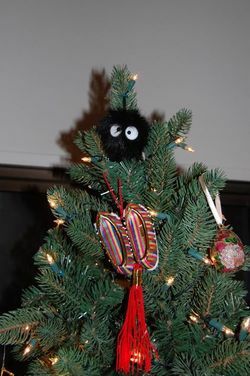 So, here's a picture of the top of our Christmas tree, adorned with the traditional dust bunny from My Neighbor Totorro . Who knew that without me telling you? 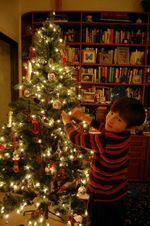 It was later replaced by an angel, but Alex and I had a good time with this when we put the tree up. See youse later. Happy Holidays! We went to see Santa arrive last weekend, only this time with a twist. 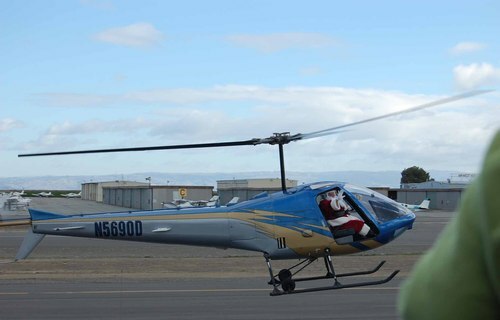 Instead of arriving by reindeer-drawn sleigh, Santa came to San Carlos by helicopter. 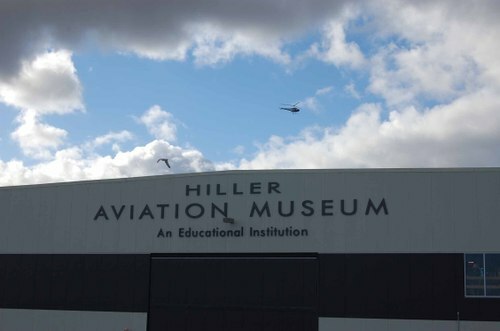 He landed right outside the Hiller Aviation Museum. We watched him circle the museum before landing. We were standing on a view platform as he touched down. Wonder if he was wearing a seatbelt. 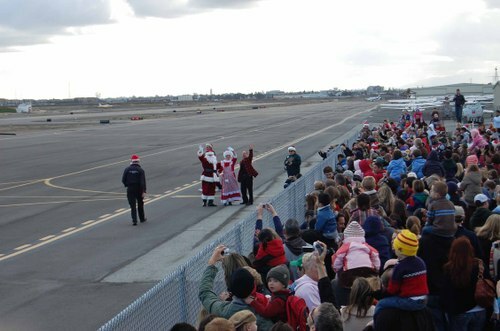 He was greeted by Mrs. Claus, the Vice Mayor of San Carlos, and a very big, enthusiastic crowd. We waited for nearly an hour in line to see the MAN, but Alex was glad to have his turn. 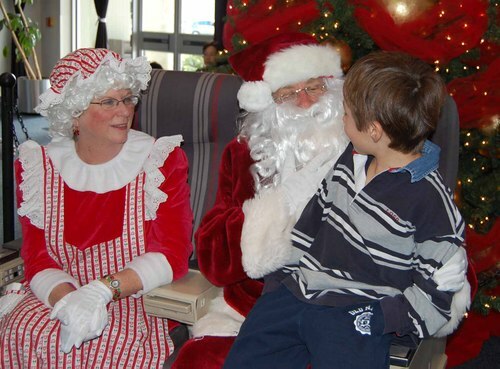 Note that Santa and the Mrs. are seated in airplane seats. Afterwards, Santa pulled Frank aside and said, "What's a Wii? All the kids keep asking for it, but I have no idea what that is." Frank explained it to him, so hopefully, Santa will stock up or make a deal with Nintendo before Christmas rolls around.